Knee Surgery: What Happens Next? We see lots of people that have knee surgery at SSOR. Whether it’s a knee scope, total knee replacement, or ACL reconstruction (and that’s not the whole list! ), the staff at SSOR are experts at getting you back to life, work, and play as soon as possible. Physical therapy after knee surgery is a must, regardless of what procedure you had done. Amazingly, many physicians tell their patients it’s not necessary, but we assure you, a great majority of people need it because they have persistent pain, gait dysfunction, swelling, inability to do the activities they enjoy, or any combination of the above. The amount though is based on the extent of the injury and sometimes, how long the delay is between knee surgery and starting physical therapy. Starting physical therapy soon after surgery will reduce knee surgery/knee arthroscopy recovery time and will minimize the risk of functional imitations and disabilities in the long run. So here are a few things that need to be done after surgery in rehabilitation. Use crutches or an assistive device. This is a big one. We have no idea why, but physicians are always in such a bloody hurry to get people off of crutches. It amazes us as physical therapists that they let people walk out of their office limping. No question, this causes more pain, delays the return of motion and strength, and keeps the knee swollen longer because of the compensatory movement. Your physical therapist should help you with that in physical therapy after knee surgery. Get your knee as straight as possible as soon as possible. The exercise below, propping your heel on a rolled towel, is a good one to do. Get your quadriceps muscles working. They are critical for gait function. Without functioning quads, you won’t walk correctly. 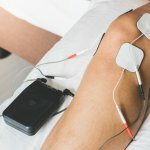 Your physical therapist can also put you on a muscle stimulator to help with this. Try “flexing” your thigh muscle several times a day to help get the muscle working again. Work on strengthening your hip muscles. At SSOR, this is a central focus of rehab after knee surgery because the knee is connected to the hip. If the hip is weak, so too will be the knee. Put another way, the hip/pelvic area is the foundation of the house. If that isn’t stable, the house will crumble. Insist your physical therapist work on the soft tissues in the knee and hip. You should expect more from your therapist than just holding a chart and telling you to do exercises. After knee surgery, there are several areas that are often tender and restrict motion return and cause pain. It may not be comfortable, but it will really help in the long run. Take it easy! You should rest for 3-4 days after knee surgery to minimize pain and reduce swelling. Swelling will inhibit your muscular return, regardless of how hard you work it. Ice ice baby! Ice as needed to help minimize pain and reduce swelling. Because of the wide array of knee surgeries and with people having various definitions for “recovery,” this is a little tricky. In general, after total knee replacement, you should expect at least 6-12 weeks of consistent therapy to restore function maximally. After knee arthroscopy, that can take as little as a week or up to a couple of months depending on how soon you start, how bad your knee was going in to surgery, and any other co-morbidities you have. For meniscus repair surgery, expect 4-6 months for complete restoration and return to sporting activities. Lastly, ACL reconstruction recovery time, for people that want to play sports, is anywhere from 6-12 months. For more inactive or sedentary people, this may be as early as 3 months. Any of these conditions however should be a discussion with your physician and your physical therapist. 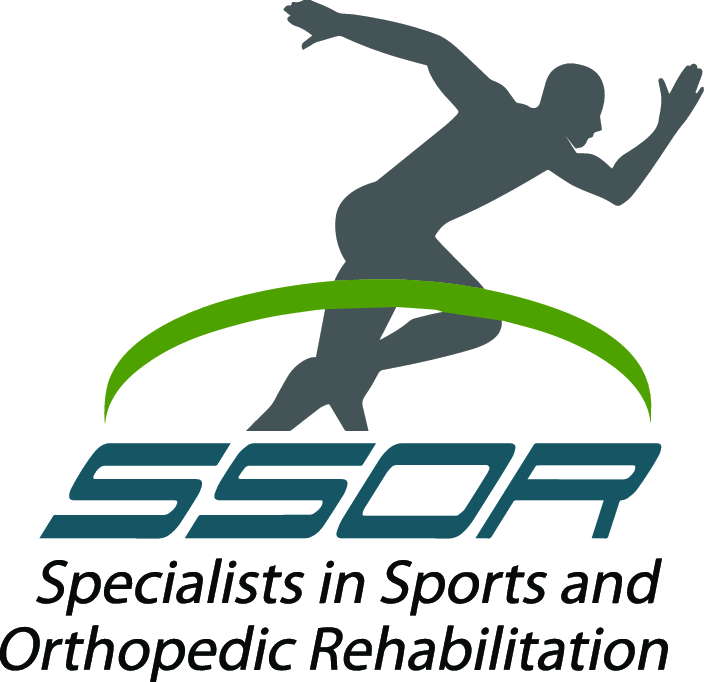 The physical therapists at SSOR are astute clinicians who understand what you had done in surgery and the individual concerns after each respective procedure. We’ll listen closely to you for what is most important to you and then develop a plan to get you back on your feet. It would be a privilege to serve you and partner with you in your care. Give us a call!